Today, I'll introduce an article in Wochi Kochi Magazine. The year 2011 is the 50th anniversary of Kuwait-Japan Diplomatic Relations. There're various cultural events related to the anniversary. 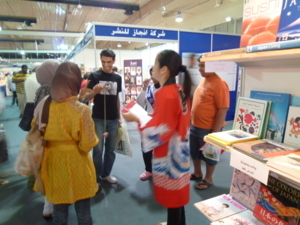 The Japan Foundation presents a Japan booth in the book fair which has been held annually in Kuwait since 1976. The Japan Foundation staff wrote a report on this book fair in Wochi Kochi Magazine, so please check it out! 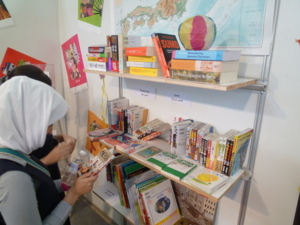 In this report, the staff wrote about young people who were admiring Japanese culture and very happy with finding the original Japanese books and CDs at the book fair. Their smiles look so happy that I also smile seeing them. Music or books can transcend the borders and fascinate people! He likes Mai Kuraki, a famous Japanese singer. I love dance, so watching dance performance and dancing with friends are pretty fun and make me happy. 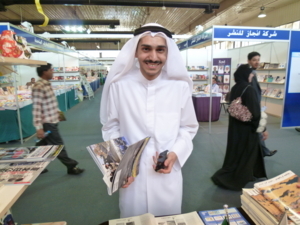 I guess those young people in Kuwait also feel joy and happiness with their favorite Japanese culture. For those who love JPOP, listening or singing JPOP songs may make them happy. For those who love anime and manga, watching or reading them, or cosplaying may! I am very happy with and kind of proud of the fact that Japanese culture brings happiness and smiles to people overseas. Autumn is a season for reading, art, sports and etc. We have many things to do in autumn, so what would you do? ?